In 2015, Microsoft’s Bing search engine achieved something it had never had before: relevancy. By notching a 20-per cent share of U.S. search, according to comScore, it managed to impact Google, the brand that was literally synonymous with search. In 2018, it seems like Bing’s willing to hand some of that success right back. Why? 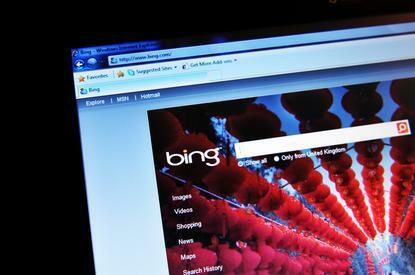 Because, as a habitual Bing user, I’ve noticed a deterioration in quality. In the past I’ve argued that there were four good reasons to switch from Google to Bing. Since then, I’ve used Bing extensively, and it still remains my PC’s default search engine. I’ve sold colleagues on the benefits of Microsoft Rewards. Like anyone else, I’ve used Bing to hunt down news, search for social media posts on Twitter and elsewhere, research queries and trips, and more. But on more and more occasions, I find myself typing in Google.com within the search bar, then hunting down some tidbit or story that I know is there. Granted—and this is important—this is a subjective viewpoint, and cherry-picking specific queries is just that, cherry-picking. But there are certain areas where I think Bing has either deteriorated or simply doesn’t measure up to Google. Consider the same search on Bing and Google: “ThinkPad,” Lenovo’s iconic notebook series. As a journalist, I often click on the “news” tab of both search engines, with the idea that I want to see relevant news from both search engines, typically referred to as Google News and Bing News. Immediately there are stark differences between the two. Bing News shows me just three results. Not only is it wasted space, but Google, by comparison, clusters several recent stories together. 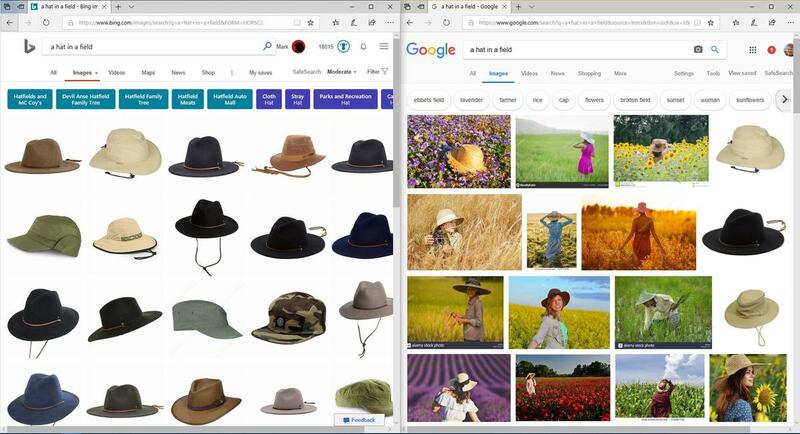 Bing favours the sort of “endlessly scrolling” web page design that eliminates unnecessary page clicks, a point in its favour. But just three entries down is a “trending on Bing” carousel with world news and politics, and nothing about the ThinkPad. That’s not what I’m looking for! Google News requires a click to jump to the next page, but everything appears relevant. When I first started researching this story a few weeks ago, Bing showed me an Atlanta crime story where a ThinkPad just happened to be one of the items stolen from a vehicle. Generic searches for news stories also demonstrate stark differences between the two search engines. I frequently use search engines to research (and link) older stories. 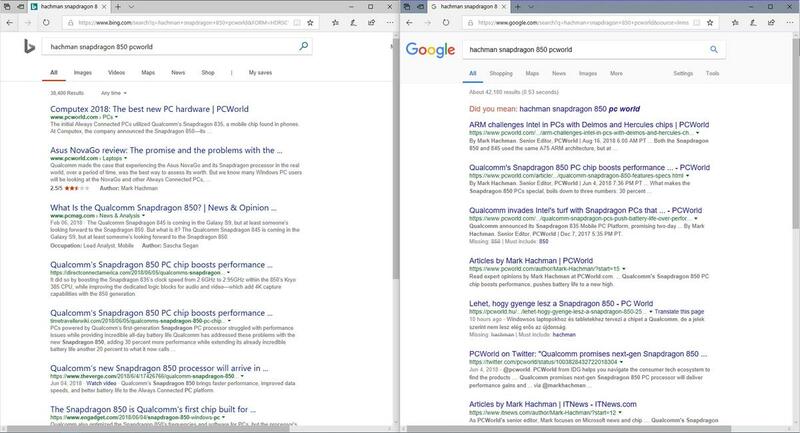 Entering “hachman snapdragon 850 pcworld” brings up the result I’m looking for within Google; in Bing, it doesn’t even appear on the first page of results. That’s a fundamental misstep, and one I’d swear wasn’t there several months ago. Bing seems to be moving in the direction of providing multiple sources or opinions to confirm reports. But from my standpoint, it’s failing at its basic goal: providing relevant links. What happened to searching social networks? 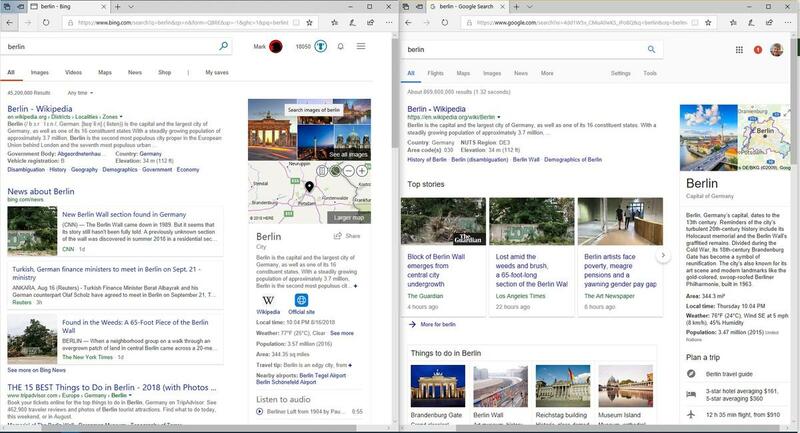 At one point, Bing touted itself as the destination for social search, with a sidebar and various tools to connect to social networks. These days it has trouble keeping up with Google. Consider the following search, where I wanted to see what the reactions had been to legendary announcer Don Criqui’s receiving the ax as the radio voice of my alma mater, University of Notre Dame (“Twitter Don Criqui”). 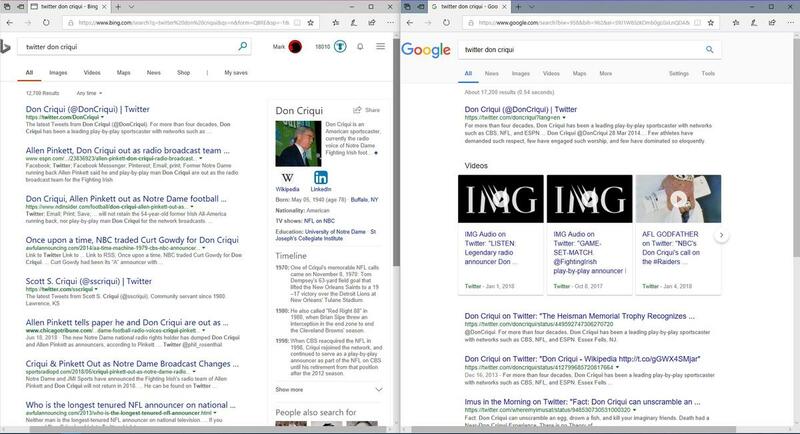 While Twitter would like you to believe that the best Twitter search lives on Twitter.com, Bing sort of flubs the whole thing outside of the lead result. One of the historical strengths of Bing is its image-search capabilities, which I revisited to see how the search engine is doing. It’s easy enough to pull up images of actress Nicole Kidman, even when the search is “Nicole Kidman at age 23” (though does Google pull up more images of a younger Kidman? Perhaps). 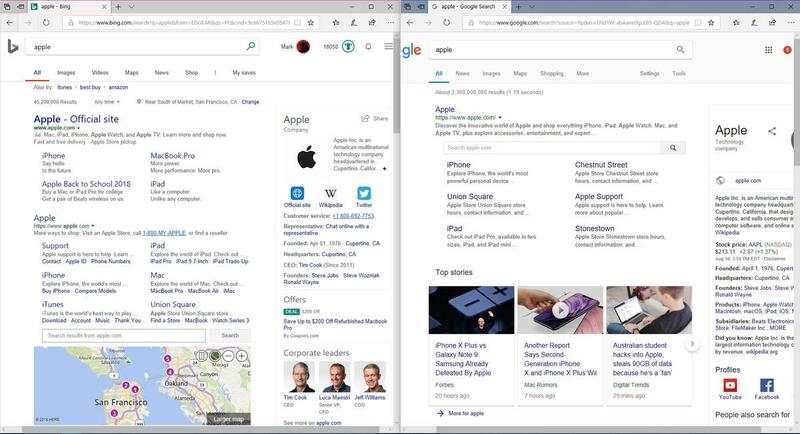 While both Bing and Google nail the first, Bing fails badly at the second. For those of you who would never search for something so detailed, that’s fine. But for me, I sometimes can’t help wondering what I’m missing. 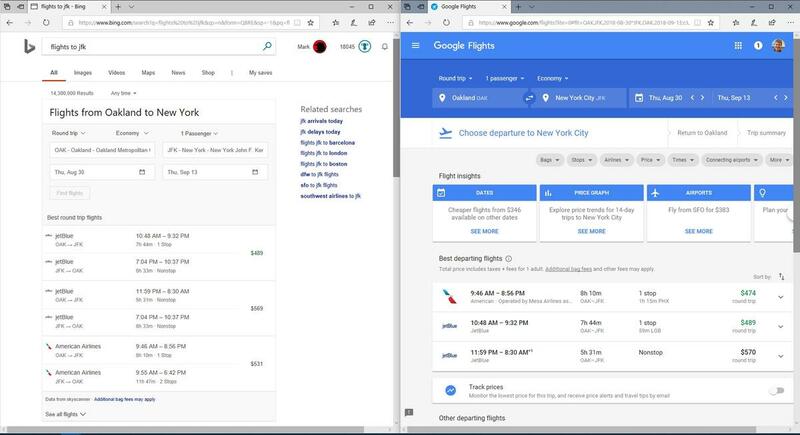 Bing may have recently launched comprehensive services to improve the hotel booking experience by aggregating third-party data, but the company’s basic travel search still remains underpowered. Take a generic search, “flights to Hawaii. 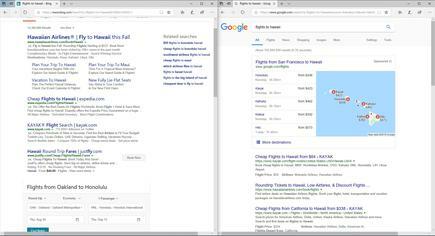 You can make a basic assumption, as Bing does, that you’ll want to fly into Hawaii’s main airport, in Honolulu. Both Bing and Google establish your origin airport via your location, which is fine with me. 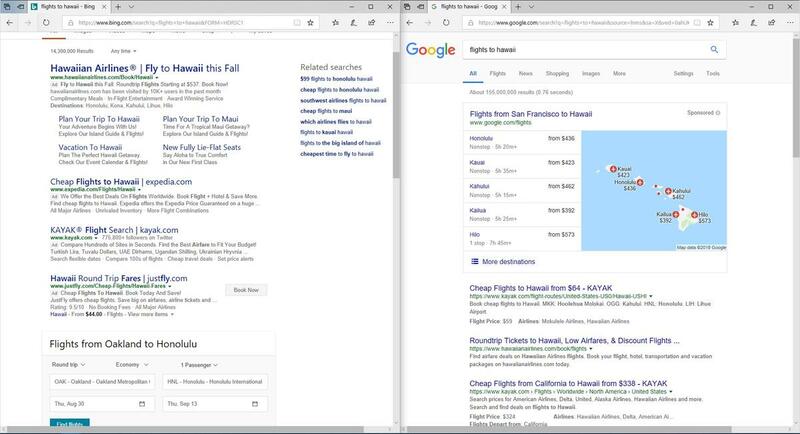 But Bing does two things wrong here: One, it makes you click on a follow-up button to check flight information and fares; and two, it should provide a list or drop-down menu of islands or airports. Bing does allow you to select how many passengers you want to bring, however. What Bing doesn’t quite seem to realise is that it’s competing with specialty travel search sites like kayak.com. Google’s website, Google.com/flights, seems to recognise this, and provides a wealth of data at your fingertips. 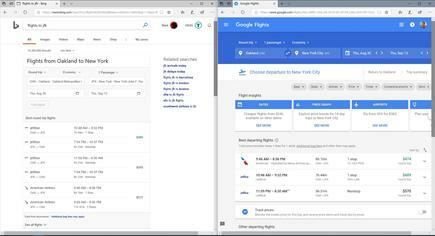 On the other hand, Bing intelligently recommends certain flights as the best for a given set of criteria, as per this search for flights to New York City. Personalisation’s benefits are what, exactly? 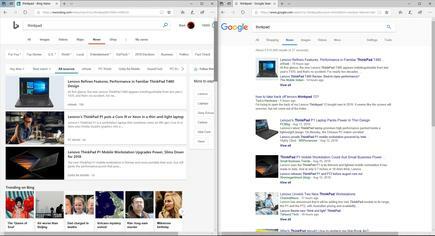 Another interesting element of the “ThinkPad” search within Bing News: The top results remain unchanged, regardless of whether I sign into Bing. As a journalist, I admit that personalised results aren’t always beneficial. If PCWorld editors are trying to assess the relative importance of a particular search term, we search anonymously. This is an anomaly, however, and it goes back to the old search conundrum: If I’m searching for “apple,” am I looking for a Red Delicious, or the computer company? If I’m allowing Bing or Google to capture my data, shouldn’t I benefit? Interestingly, Google seems to give me the same top search results when searching for Apple whether logged in, or anonymous. 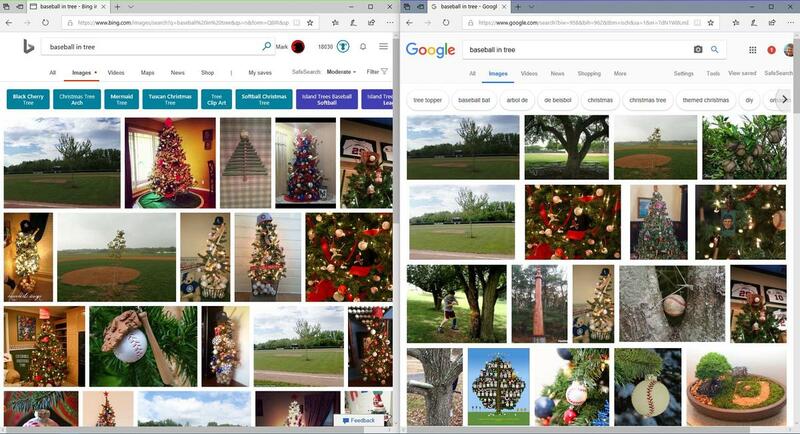 But I noticed one difference: When logged into Bing, Bing surfaced several images of apples (the fruit) within its images tab. Google apparently knew (or guessed) that the Apple logo was what I was looking for. Both identified Apple Stores near me. Really, this isn’t so much of a Bing-vs.-Google issue as it is just a question of what benefit you gain for trading off your privacy. I realise that personalised data is designed to influence ads, not search results. But isn’t it time we got a bit more out of the deal? 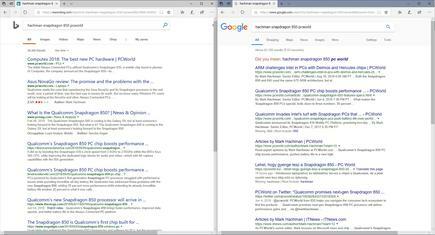 There is one search segment where Bing runs neck-and-neck, or even ahead of, Google. 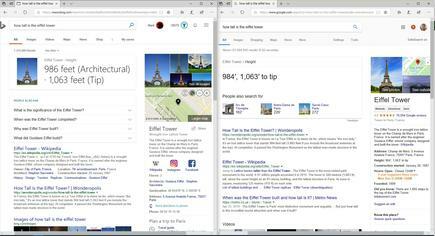 When asked a basic question (“how tall is the Eiffel Tower?” “How old was Lincoln?”), Bing acts less like a search engine and more like an encyclopedia, answering the question and then encouraging further exploration via related facts. 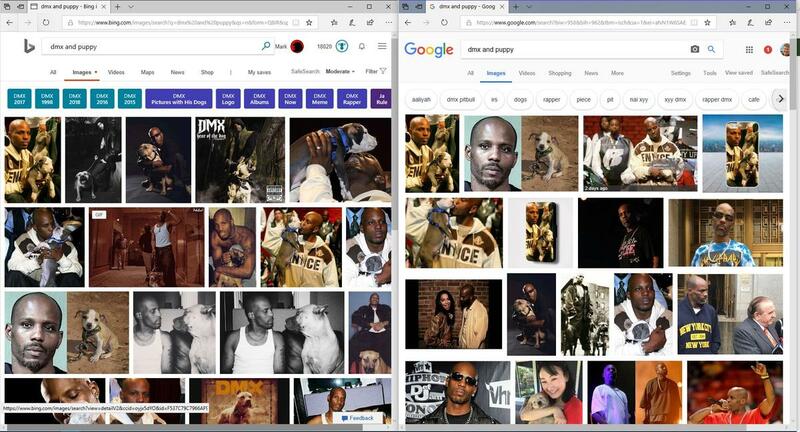 Google does well here, too. Part of this involves using the sidebar area to the right of the main search results to provide more information. For even an exceedingly generic search term (“Berlin”) Bing brings up things to do, facts, images, and news. Google does as well, though, and offers to plan a trip. 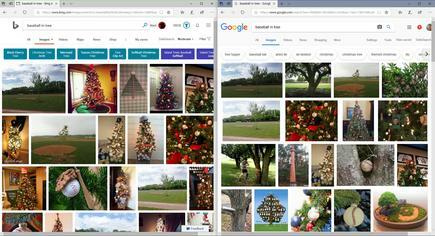 While Bing comes off well in this comparison, I think Google goes a bit further in providing a user-friendly experience. (As well as e-commerce opportunities). Microsoft’s management clearly believes that Bing’s road to success lies in this broad middle ground of frequently-searched terms, rather than in some of the more specific niches that I’ve highlighted. “Bing it” may never become a common verb. But if I’m turning more and more to Google, I just wonder how many other people will make Google their default search engine—for the first time in several years, I’m considering it myself.